It's summertime, which means that it's a perfect time to get out of the house and get together with some friends in the warm sunshine. If you're looking for some activities to do, (I know I usually am, I frequently find myself Googling "friend date ideas"), I've got you covered. 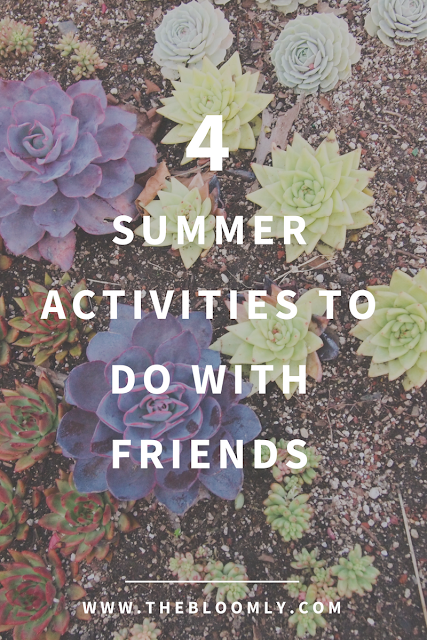 Here are 4 fun summer activities that you can do with your friends. Get together with some friends and build terrariums! All you need is to go out and buy some succulents and whatever you want to build your terrarium in, then get your friends together. Get some food as well so that you can eat, chat, a build. This will make for a fun activity in the moment and then at the end everyone gets to walk away with a little terrarium. I think that this would make for a great activity to do at any party. Currently planning a terrarium building party with some friends and I'm very excited! Yes, a quintessential summer thing, but it's a classic for a reason. Get some friends together and head to a waterpark nearby. You can do something as elaborate as one of those fancy waterpark hotels, or simply a pool that has a slide, whatever best fits your budget and your needs. Waterparks may be popular for kids, but just because you're "grown up" doesn't mean that waterparks can't be fun anymore. There are lots of "paint a pot" style shops all around that you can probably find one close to wherever you live. If you don't know what a "paint a pot" style shop is, it's essentially a shop that has lots of blank undecorated ceramic items (ex: mugs, figurines, plant pots, plates, piggy banks, etc.) that you can then paint and make it your own. The shops usually provide all the materials that you need to customize your ceramic item and then will put it in the kiln for you so that you can pick it up and take your creation home. Break out the string lights to decorate and the lemonade for the dinner! Recently, I helped my sister throw an outdoor dinner party and it was so much fun! We planned out a fancy three course meal (if you're on the Bloomly newsletter, which you should ~totally~ join if you're not already on it, you would know more about this + what was on the menu from a couple weeks ago) and it was really fun to make the food and also see how impressed everyone was by it. The food tasted great and there was just a lot more of a relaxed carefree vibe than if it was at a restaurant.